Operating since 2011, Qatar’s Nakilat-Keppel Offshore & Marine Ltd (N-KOM) offers a range of repair, conversion, maintenance and fabrication services to marine, offshore and onshore industry. The shipyard has delivered in excess of 800 marine and offshore projects to date, of which 20% is made up of LNG carrier repairs. In comparison to the first half of 2017, the year 2018 has a marked increase in volume about 25% in terms of repairs and other works. In addition, the shipyard won a competitive bid for the installation of Scrubbers and Ballast Water Management Systems (BWMS) for a series of VLCCs belonging to one of the top tanker operators based in Greece. At the end of August, the first VLCC of a series will undergo routine dockings and retrofit of an in-line type of Scrubber as well as of a Ballast Water Treatment System. Three or four more will follow through September and October, where work is expected to continue through to 2019. In the first half on 2018, the shipyard had retrofitted two sister Very Large Gas Carriers (VLGC) with Ballast Water Management Systems (BWMS). N-KOM already had experience carrying out installation of three different BWMS previously – namely Samsung, OceanSaver and Alfa Laval respectively. As such, the duration in the yard between the first and second retrofit was observed to be significantly reduced by 43%, demonstrating N-KOM’s competency and efficiency in handling such complex projects. The shipyard continues to experience strong interest for its repair services from ship-owners, with July and August fully booked for repairs at the facility. Most of these vessels underwent routine drydocking and repairs such as cargo tank inspections, overhauling of main engine cylinders, LNG cargo and spray pumps, general steel repairs, hull treatment and painting, propeller blades cleaning and polishing, overhauling bow thruster, main boilers internal inspection, load tests for the life boats as well as various other inspections and repairs. 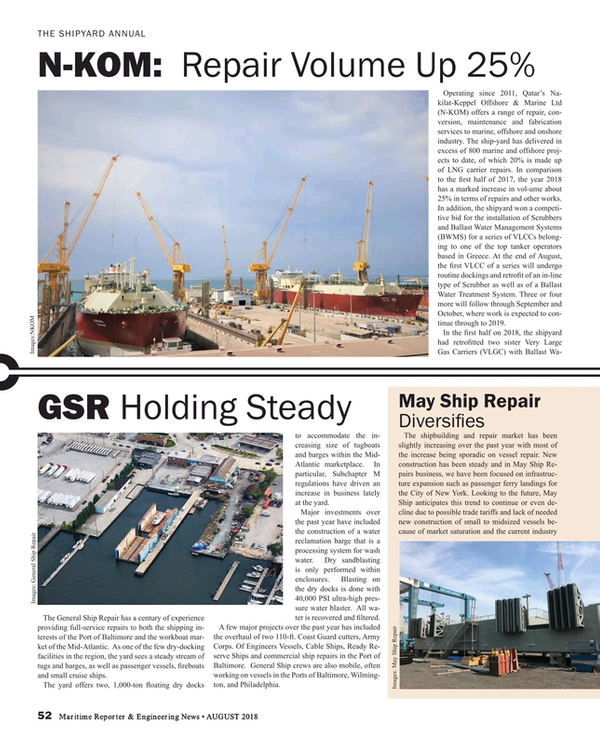 N-KOM’s experience in LNG carrier repairs has attracted 18 vessels for routine docking and membrane repairs in the first half of the year so far, with a number of LNG carriers booked in for repairs later in the year. N-KOM has carried out extensive cargo tank membrane repairs for LNG carriers, using its in-house team of Gaztransport & Technigaz (GTT) certified welders to carry out welding works for GTT (Mark III and NO.96) containment systems. The presence of prominent maritime service providers such as GTT, Goltens, Wärtsilä, Wilhelmsen Ships Service, Turbo Technik and Cargotec operating within the shipyard greatly facilitates the overall repair process, offering convenience to ship owners and managers patronizing the shipyard. The growth of LNG spot market has resulted in a significant increase of inquiries for LNGC repairs from vessels that are not traditionally trading in the Middle East Gulf area. Notwithstanding the depressed tanker rates, the shipyard expects continued strong interest for tanker repairs in the second half.